Dale presented this address at the Indiana University Kelley School of Business in November 2014. It’s an honor for me to be here with you today and share some of the insights and lessons I’ve learned as an entrepreneur in the automotive retail business. I came up with the 4 P’s of Entrepreneurial Success after thinking long and hard about the factors that have enabled me to become successful as an entrepreneur and a person. It’s my sincere hope that our time together today will leave you with a nugget or two that has a positive impact for each of you to apply in your work here at IU and in your careers. It’s pretty cool for me to come back to IU. I spent four years here from 1976 to 1980, when I graduated with a degree in business administration. I came to IU because, like many of you, I’m a Hoosier. I was the youngest of four boys, and our dad owned a Buick-GMC-Jeep-Renault dealership in Gary, Indiana. As a student, my goal was to learn enough to prepare me for a career in the family business. It wasn’t necessarily my first choice, but given that none of my brothers were interested in the business and the ongoing deterioration of my eyesight, becoming a car dealer was really my only viable option. Now, many of you weren’t even born yet, but the economy was pretty bad when I started working at the Cadillac dealership my father had opened in Elmhurst, Illinois, after selling the operations in Gary. We faced many of the same challenges in the early 1980s that car dealers encountered when the economy tanked in 2008 — sales of new cars essentially dried up, and the main source of income for the dealership slowed to a trickle. Thankfully, my dad was smart enough to recognize that even as new car sales were sagging, people would still need transportation, and he put me in charge of the dealership’s used car department. When I took over the used car department, I was worried that I would be a liability. I couldn’t see the cars and size them up the way other used car managers could. By that, he meant that even if I couldn’t see the cars, I could still judge them on a financial basis. It would be my job to make sure that we didn’t pay too much to buy the cars when we purchased them from wholesale auctions or from customers trading in their used cars. Likewise, he taught me the important lesson that used cars were really time-sensitive investments — meaning, the longer they stayed on our lot, the less chance we had to maximize our profit margin. With these understandings, I managed our used vehicles from an investment perspective. While I cared whether a car looked sharp and had instant appeal for buyers, I was more concerned about making sure each car provided a sufficient return on investment for the dealership. As I look back at my years at the family dealership, I now realize that I wasn’t really cut out to be a dealer. In the early- to mid-90s, desktop computers were becoming the norm in businesses across America. I found myself more interested in tinkering with technology. I honestly didn’t pay as much attention to the daily requirements of the used vehicle department as I could or maybe should have. Around 1997, I got a phone call from a company that wanted to sell me a kiosk that I could put in my showroom to let customers look through our new / used vehicle inventories without physically walking the lot. This company told me they didn’t need wires or a big database to display my cars in the kiosk; they could use a new technology called “the Internet” to make the kiosks work for customers. It might be hard for you guys, who have all pretty much grown up with computers and the Internet, to understand how much this blew my mind. It wasn’t wireless technology as we know it today. They were using phone lines to move the data, but a technology-interested person like me recognized that a system that worked without cables and wires was pretty revolutionary. It was around this time that I had what you might call my first real entrepreneurial insight. For years and years, I’d dutifully advertised my vehicles in the Chicago Tribune. It was a weekly ritual to prepare our classified and display advertising for the Saturday and Sunday editions. In 1998, the Tribune was starting to launch Cars.com, a website that would display all my vehicles on the Internet. Given my interest in technology, I was one of the first Chicago-area dealers to explore this new advertising option. You might say I had enough good sense to recognize that the Internet would be a powerful advertising channel. But this new Cars.com venture posed some challenges for dealers. I was being told that if I wanted my vehicles and their photos and descriptions to appear on the site, I would have to enter the information manually. Looking back, I was lucky to be the guy who put two and two together. I thought: What if the kiosk company’s technology, which used the Internet to move my inventory information from my dealer management system, would work for this new Cars.com website? I started making phone calls to the kiosk company, which was called Digital Motorworks Incorporated, and my contacts at the Tribune and Cars.com. It turns out that my vision for the efficient, standardized method for moving inventory to my local paper’s website opened an opportunity that was far bigger than I had imagined. After much soul-searching and discussion with my father and family, I made a huge, difficult decision. I sold the family dealership and went to work for DMI. This decision was definitely a risky one — the technology we envisioned wasn’t proven, and it wasn’t fully clear that other dealers would share my enthusiasm for this new thing called the Internet as a resource to advertise their inventory. As it turns out, my fears and worries proved to be unfounded. As DMI began working with Cars.com, our technology proved to be a winner. We signed a big deal with them as their sole back-end technology provider to transfer dealership inventories to their site. Our timing was also fortuitous because the car business was in the early stages of consolidation. A company called AutoNation was coming onto the scene, and they also recognized the value of the Internet and sites like Cars.com as advertising outlets for their used vehicles. We inked a deal with them to get their used vehicle inventory online. From there, we landed a lot of big deals. Manufacturers like Ford, GM, Honda, Toyota and others also wanted to put dealer inventories online, and DMI was the logical choice. It didn’t take long before we started getting calls from large software vendors about a potential acquisition. In 2002, my partners and I made the decision to sell DMI to ADP, a New Jersey-based company that provided accounting, inventory management, sales and service software to dealers across the country. This was perhaps my first proud moment as an entrepreneur. The acquisition validated my vision that the Internet would be a powerful force in the automotive industry, and the acquisition brought decent return to my partners and me. As part of the acquisition deal, I was given a three-year contract to stay on as part of DMI under the broader ADP corporate umbrella. Well, I wish I could say I was a model ADP employee, but I wasn’t. Looking back, I’d had no experience working for someone else, other than my dad. He knew how to handle the fact that I liked to speak my mind and challenge the status quo. The same wasn’t true at ADP, and after a year with the company, they fired me. Thankfully, I received the balance of my three-year contract as severance. It was a decent amount of money, but it wasn’t anything close to what I’d need to sustain my family and myself over the long haul. There I was, a blind guy in his early 40s who really had no other prospects for future employment. I spent a lot of days on the couch at home, thinking about my predicament and worrying that I wouldn’t be able to support my family over the long term. It was during this period of soul-searching that I took serious stock of my abilities and capabilities as a person. Because of my visual condition, I couldn’t get a job bussing tables at a restaurant or working as a cashier at a gas station — or even selling cars at a dealership. First, I recognized that the Internet was driving profound change in the used car business. I reflected a lot on my father’s wise words that “it’s the money, honey,” and it seemed to me this was becoming ever more important for dealers to understand. With sites like Cars.com and AutoTrader.com showing vehicles and prices, dealers were faced with a lot more price transparency than they’d ever seen. Second, I realized that if dealers were going to be successful advertising their vehicles and prices online, it would become even more critical that they owned their vehicles right from the moment they purchased them at auction or trade-in. If they didn’t do this, the Internet increased the risk that dealers would fail to make the return on investment they expected each vehicle to generate. Third, I realized that most dealers and used car managers did not think about used vehicles as actual investments of capital the way I’d been taught to treat them by my father. Most dealers did the same thing they’d done for decades — they still made used vehicle decisions following their gut instincts, particularly when it came to purchasing them at auctions or trade-ins. The insights I realized while lying on the couch led me to create mPower Auto. The mPower tool also provided daily scores for each used vehicle in the dealer’s inventory. On any given day, they could readily see their equity position in relation to the wholesale market. The tool sought to provide a framework for dealers to begin to manage their used vehicles as investments, helping them learn the same “it’s the money, honey” lesson I’d learned from my dad. I believed the value mPower would bring to dealers would become increasingly important, in light of the Internet’s rising influence. I invested all the money I had in this new venture. I went back to everyone I knew in the car business and started knocking on doors to sell them my new system for determining what to pay when they acquired a used vehicle. The early days of mPower Auto were not easy. Even though I was calling on dealers who my father and I had known from our time in the business, the reception I received was less than warm. To put it bluntly, I got kicked out of more dealerships than I’d care to remember. Things weren’t looking all that good for me and the family fortune I’d invested in this new venture. I remember calling my wife in tears and telling her that I thought I’d lost all of our money. I was depressed that dealers didn’t seem interested in what I thought would be a highly successful product. If I could have, I would have simply given up. But I didn’t have any choice. I had my family to support. I had to make mPower work. I started to think long and hard on why this new product, which made perfect sense to me as a former investment-minded used car manager, wasn’t resonating with dealers. This reflection made me realize that I had, in fact, violated both of the Two Fundamentals of Wrong. The first fundamental is that people don’t like being told they’re wrong. Yet, when I visited dealers, I would use the mPower tool to show them why what they were doing was wrong. 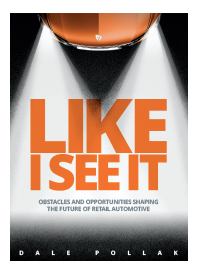 As you might expect, this didn’t go over too well with guys who were proud of their ability to use their eyes and instincts to judge a vehicle’s retail potential. Even worse, I was expecting these guys to open their checkbooks and buy my software after I basically told them they didn’t know what they were doing. The second fundamental is that being too early is exactly like being wrong. This lesson was harder for me to realize at first, because I thought the mPower solution gave dealers exactly what they needed to buy used vehicles correctly and make money in an environment where the Internet was changing the way they did business. But the reality was that most dealers weren’t ready to embrace the Internet or hear my message; the business practices and culture of most used vehicle departments were too entrenched in the ways of the past for a blind guy with a newfangled software tool to make a difference. Despite the problems with the mPower tool, we did see some success. After a lot of determination and resolve, and two years on the road, we had signed up 40 dealers as customers. Their business gave us just enough revenue to keep the venture going, but I wasn’t really making a living. I was also spending an extraordinary amount of time working individually with these dealers. They were on month-to-month contracts, and could cancel their deal with me at any time. I felt I had to nurture the business on a daily basis to keep it. But as I worked with the dealers, I encountered the same problem over and over again. While the dealers were now able to buy their used vehicles “on the money,” they still applied standard markups of $3,000 to $5,000 on every car, irrespective of the competition in their markets. Time after time, I would go online and show dealers how their vehicles were overpriced compared to competing cars. I sounded like a broken record as I explained that, with the Internet and sites like Cars.com and AutoTrader.com, used vehicle buyers could easily compare cars online. They didn’t have to travel to five or six dealerships to find the cars / prices that fit their needs and budgets. It wasn’t reasonable for dealers to expect their online vehicles to generate showroom traffic when they were overpriced. After doing this about 1,000 times, I had an “aha!” moment: Why don’t I just create software that would help dealers price their vehicles to be in line with all the other cars on the Internet? I realized that if dealers had access to competitive pricing online, they would be able to make mark-up decisions that were more in line with the market. I believed that if dealers would follow more market-based pricing strategies rather than the traditional mark-ups, they would see more traffic in their showrooms and sell more vehicles. As you might imagine, I was pretty excited that this new software system, built from the insights we’d learned from mPower, would prove a winner with dealers. But I had a problem: I was out of money. I’d mortgaged my home and invested all of my savings in the mPower effort. I was faced with the frustrating prospect that many entrepreneurs face — you’ve got a great idea, but lack the capital to build and pursue it. While I was reluctant to do so, I decided I needed to turn to venture capitalists to help fund my new idea. Luckily, I was able to get an investment from Bain Capital to take a new product, vAuto, to the marketplace. We built software that would essentially scrape information from used vehicle listings on sites like Cars.com and AutoTrader.com. Our software would gather data on pricing and specific vehicle attributes to give dealers the ability to compare their prices with competing cars. In addition, our software kept track of when specific cars appeared online and when they disappeared, meaning they had been sold. For the first time, auto dealers now had access to real-time supply and demand data to help them make decisions about used vehicles based on the market, not their instincts. First, my advisors at Bain told me that it’s rare for entrepreneurs to get their product exactly right the first time. They said it was common for an entrepreneurial product to pivot, given the realities of the market. This insight relieved a lot of anxiety that I’d failed with mPower and the need to create a new solution was a sign of failure. Instead, Bain helped me understand that, in fact, mPower was a stepping stone to potentially greater success. First, by focusing vAuto on helping dealers price their used vehicles rather than mPower’s emphasis on owning them for the right money, we were addressing an issue that dealers could actually fix. With mPower, we were telling them about mistakes they’d made in the past on vehicles they’d already purchased. By contrast, vAuto helped them address pricing decisions that could be adjusted, given market conditions. Second, vAuto’s emphasis on competitive, market-based pricing was a more objective approach to helping dealers run their businesses than mPower’s frontal assault on the subjective, instinct-driven ways dealers used to determine how much to pay for a used vehicle. Put simply, you couldn’t really argue with the Internet, and dealers could easily see if their vehicles were in line with the market or not, and understand the implications. My Bain advisors were also invaluable in helping me understand the value of the “right message” for a new product or service. I learned that no matter how good your product may be, if you lack a compelling message, the product won’t reach its full potential in the market. With the Bain investment, we were able to hire an ad agency that helped us drill deep into the DNA of vAuto, and the value it truly represented for dealers. The agency team listened intently to things I’ve just shared with you — dealers weren’t treating used vehicles as investments, they didn’t buy cars right and they priced them in a fashion that was more reflexive than reflective of the market. There it was, a simple yet profound message I could not have come up with myself. Yet, it absolutely crystallized the vAuto value proposition: If you priced your vehicles in a more competitive-minded fashion online, buyers would respond by showing up at your dealership to see your vehicles. As I visited dealerships from then on, I no longer brought a 25-page PowerPoint presentation. I simply told them that my system allows you to price your vehicles to rank higher on Internet search results and drive more showroom traffic. Now, as I mentioned earlier, Bain Capital’s involvement gave us funding to build the software and advertise our message, but it wasn’t enough money to effectively reach nearly 50,000 franchised and independent dealers spread out across 50 states. To be sure, vAuto was more successful right out of the gate than mPower Auto, due to its emphasis on market-based pricing and its compelling “rank higher, hello buyer” messaging. But these successes were more grassroots. They occurred on a market-by-market basis, in places where we were able to successfully secure a dealer customer. It became clear to me that we needed a cost-effective way to scale our messaging that would be more effective and impactful than relying on our current efforts of going door-to-door to sign up dealers. About the same time that we were contemplating the need for a broader platform to advance vAuto’s messaging, I read the book Moneyball, by Michael Lewis. I’m sure some of you have seen the movie and know that Lewis’ book captured the way Billy Beane and the Oakland A’s used new data and metrics to assess a player’s potential success as a member of the team. Beane and his crew basically invented metrics, such as on-base percentage, that are now used throughout the Major League as part of a player’s performance statistics. Well, you know me, I can be a bit stubborn, and I was convinced it was the right thing to do. So, despite the discouragement from the people who were funding my new venture, I wrote Velocity: From the Front Line to the Bottom Line, the best-selling first installment of what has become a three-part series on the philosophy behind using market data and metrics to guide the decisions dealers make about their used vehicles. The book went viral and, in a very cost-effective way, helped spread the message of vAuto in ways that no other medium could ever have accomplished. As an aside, I still share a laugh with the Bain advisor who thought the book was a dumb idea — perhaps proving that while venture capitalists are typically very, very smart, they don’t know everything. Part of the reason the book proved so successful came from the economic conditions that arrived in late 2007 and early 2008. As the economy went south, sales of new vehicles essentially dried up. Times were very similar to the conditions my father and I faced in the early 1980s, only worse. The economic downturn forced dealers to pay more attention to their used vehicle departments. But as they shifted their focus, they found the business had changed dramatically. In fact, the used vehicle business had become an Internet business, and the traditional practices of acquiring, merchandising, pricing and retailing vehicles were fast becoming irrelevant. This situation only enhanced the positive reception of my first book and vAuto. The book squarely addressed the fundamental, Internet-driven changes dealers were facing in used vehicles and offered them a way forward. The combination of these factors sent the sales of vAuto and the book through the roof. I began to get invitations to speak at industry conventions and large dealer groups. Now, instead of me travelling to dealerships across the country, sleeping in crappy hotels and eating the worst fast food imaginable, dealers were coming to us. While vAuto was blessed with more new customers than I had imagined possible, I quickly understood that we were at risk. We were a small company, and the pace of new sales and fulfillment threatened to overwhelm our team and, if left untended, could undermine the business itself. I had seen similar conditions during the fast-paced growth of DMI, and I instantly recognized that I was ill-suited to be the person responsible for bringing a higher level of capacity and organization to our growing company. As an entrepreneur, my ability to recognize my limitations is a bit unusual. Unlike most entrepreneurs, who are unwilling to hand over the reins of the companies they create, I understood the necessity of doing so for the benefit of my partners and myself, our employees and our ever-growing list of dealer customers. With the help of Bain, we searched for a CEO who could effectively help the company “grow up” with a proper organization and sales structure to ensure a sustainable business. Meanwhile, my decision left me to focus on what I do best — innovating our product and evangelizing the vAuto message at dealer meetings across the country. vAuto’s success didn’t go unnoticed. By 2010, we had secured more than 3,000 dealer customers, and we were creating quite an impact in markets all across America as dealers adopted our solution and began out-selling the competition. I started receiving calls from larger companies asking if I was interested in selling the company. In most cases, I readily said no. But one inquiry, from AutoTrader.com, caught my attention. I’d come to know the CEO from dealer meetings. He approached me one day and asked if I had ever considered having vAuto join the AutoTrader family of companies. In case you don’t know, AutoTrader.com is owned by Cox Enterprises, which also owns Cox Communications and Cox Media. Besides AutoTrader.com, the company also owns Manheim, the single-largest wholesale used vehicle marketplace in the United States. First, the acquisition would have to properly monetize vAuto to provide financial security for myself, my family and my partners. Second, AutoTrader would have to provide for the security and well-being of my employees. I’d come to understand Cox as one of the greatest companies in the U.S., and I believed my employees would be able to thrive under its ownership. Third, I needed to make sure AutoTrader.com would ensure the continued growth and innovation of vAuto’s products to serve our dealer customers after the sale. Finally, I wanted some guarantees of entrepreneurial freedom if I sold my company and went to work for AutoTrader.com. After much soul-searching, I came to the conclusion that the acquisition met my conditions and made really good sense on all accounts. In October of 2010, my founding partners and I traveled to Atlanta and signed the papers that gave AutoTrader.com ownership of vAuto for $230 million, an amount that represented roughly 12 times our annual revenues. As I stand here before you, it’s slightly more than four years since my partners and I traveled to Atlanta to sell our company. In hindsight, the acquisition has exceeded my expectations. For one thing, I still work for Cox Automotive, and I’ve never been happier. They have created an environment where I can thrive as both an entrepreneur and a person. It’s kind of hard for me to say this, but I actually like working for someone else. Second, all of the key employees and people at vAuto who were part of the company at the time of the acquisition remain on the payroll today. Finally, vAuto is doing better than ever. We are now a $150 million business with nearly 7,000 dealer customers. We’ve extended our product lines into new vehicles as well as the independent dealer marketplace. We have exciting new products in the pipeline. All of these positive outcomes are directly related to the promise that Cox Automotive and AutoTrader.com extended at the time of the acquisition. As weird as it may sound, this is a big company driven by an entrepreneurial spirit that’s alive and well across multiple business units and thousands of employees. I honestly feel indebted to them for the opportunity they’ve provided for me to realize a level of prosperity and job satisfaction I didn’t know I’d ever reach, and for providing the ongoing financial rewards, job security and satisfaction they give to the hard-working and loyal employees at vAuto. The Person: In my view, any successful entrepreneur must be both driven and resilient. I can’t tell you how many times, especially in the early days of mPower Auto, that I was ready to quit. I faced more rejection on a daily basis than any person, let alone a blind guy, would want to face. But remember: For me, it wasn’t a matter of choice. I had to make this work because I had no alternative. I had to find the inner strength to move past each rejection, buck up and start selling tomorrow. The Problem: The scale of success for any entrepreneurial venture is directly related to the size of the problem and the size of the economic value a product or solution will offer. In vAuto’s case, our solution helped some dealers stay in business and prosper at a level they didn’t consider possible. The Product: The main lesson here is that none of you, as entrepreneurs, should expect to get your product or solution exactly right the first time. As my advisors at Bain taught me, it’s rare when an entrepreneur gets it right, and it’s far more common for market realizations and realities to require that the entrepreneur and his / her product pivot to account for new understandings. Prosperity: I believe my experience offers three valuable lessons about the prospect of prosperity. First, it’s important that entrepreneurs understand the risks of managing success. If a business grows so fast that it’s unable to make good on its deliverables or promises to customers, it’s highly likely that the business will falter and fail before the entrepreneur will enjoy the benefits of prosperity. Second, it’s important to know your own limitations. As I mentioned moments ago, I well understood that I was not cut out to be the guy who built the organization and structure vAuto would need to remain a sustainable and viable business. The reality is that your entrepreneurial venture, like your children, will eventually grow to a point where you’ll need to let go to remain relevant. Focus on doing the right things today, and tomorrow will take care of itself. It was great meeting you at the MBA program. Your work, too, is very inspiring. Please keep me abreast of developments.